There are many economic reports in Euro zone and the US to influence EURUSD such as Unemployment Rate, Italian Monthly Unemployment Rate, Final Manufacturing PMI, German Final Manufacturing PMI and French Final Manufacturing PMI in Europe and Total Vehicle Sales in the US. 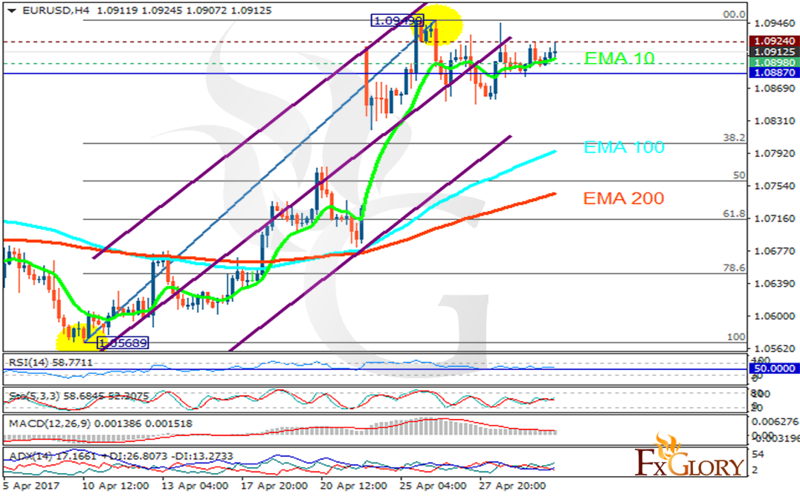 The support rests at 1.08980 with resistance at 1.09240 which both lines are above the weekly pivot point at 1.08870. The EMA of 10 is moving with bullish bias along the ascendant channel and it is above the EMA of 100 and the EMA of 200. The RSI is moving horizontally above the 50 level, the Stochastic is moving in middle ranges and the MACD indicator is in positive territory. The ADX is showing buy signals. Long positions are recommended targeting 1.095 however pullbacks can be seen along the way creating stronger buy opportunity.